I’ve been doing this health coaching thing for a little while now and I can almost predict what people are going to say before they say it. It is part of why I’m so passionate about Derbalife – I want to help my friends answer questions. Because honestly, it can be really confusing when you’re trying to figure all this out on your own! There are a billion fad diets and trends, and everyone has a different idea of how much you should eat and what you should eat. And then the SCHEDULING? WOOF. That can be rough. So, while my method isn’t perfect by any means, and there is still some trial and error that goes along with creating plans for yourself, I wanted to share with you what I have created for myself. 1) This is my 90 day plan. As I approach the end of 90 days, I will re-evaluate, tweak, and create a new 90 day plan (that won’t look too far off of this one, probably). 2) Bout weeks will change up my schedule. I will do a deload leg day on Thursday, and will rest at least a day and a half before a bout; more than that for a more competitive game, or for a weekend competition. 3) I have eased into this schedule. I did not just decide one day to work out this much. This has been a two and a half year process. Do not just try and hop into a two a day program. Work with a sports trainer if you’re unsure of how to plan out your cross training. 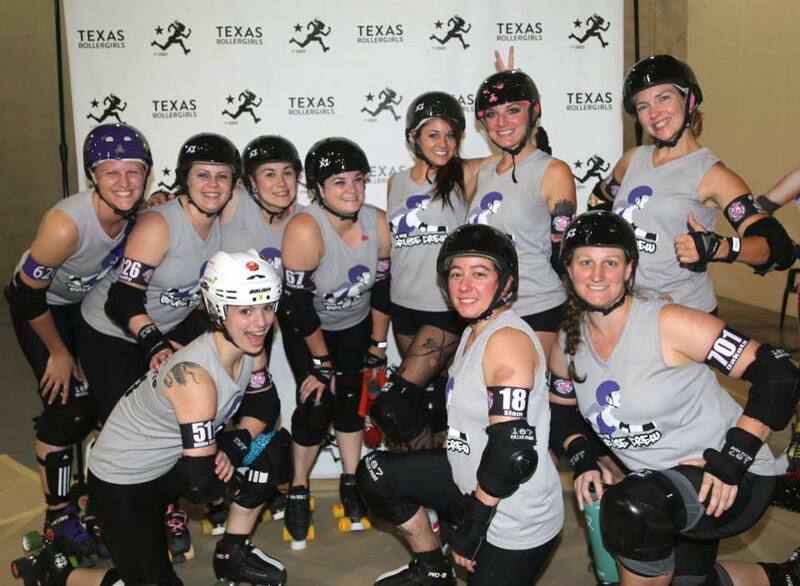 4) I have nothing to do other than work, train, and play/ref/watch derby. Do not look at my schedule and think “Wow. I could never do that.” **kick stones** “I guess I just won’t do anything”. No. That is not the point here. The point is to show you how you can break down every day of your week into an intentional plan. So the first thing I did was color coding. I broke my day into half hour bite sized increments. Then I went through and blocked out the scheduled pieces: work time, drive time, practice time is all set. I can’t change them, so they go in first. From there, I could build my cross-training schedule. After that, my extra stuff could go in. 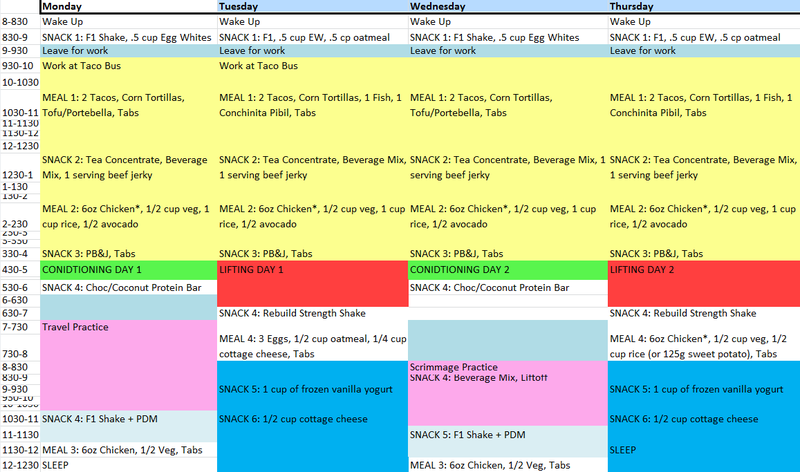 Once I could see what my days look like, I could build my meal plan. I know that when I work at Taco Bus I can only eat meals during certain times. I also know that I get employee meals. The goal is to eat every 2-3 hours, starting with eating within 30 minutes of waking up. I walked through my day, and found times that I thought I’d be able to eat. I typed in what I thought would be good snacks and meals. I put in as many snacks and meals as I thought would hit my desired calorie count… which… originally… I thought was 2000 calories. As you can see, below, it is NOT 2000 calories. 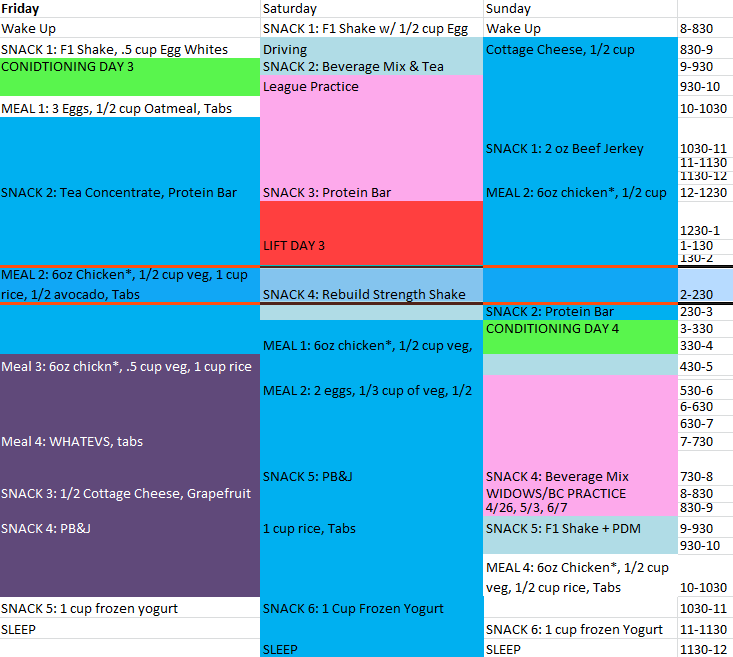 So after I planned out Monday, then I went onto a calculator program on If It Fits Your Macros. When you walk through the calculator, I always encourage people to use the athlete formula (since it factors in your exercise amount, not just your body fat). I, personally, am on a plan to help me gain conservatively. Everyone’s goals are different, and that’s ok! I would recommend, for derby athletes that you choose either the “Recommended” for WEIGHT LOSS, the MAINTAIN, or “Cautious” for WEIGHT GAIN. PS Macros are : Fat/Protein/Carbs/Fiber. How I got my numbers? 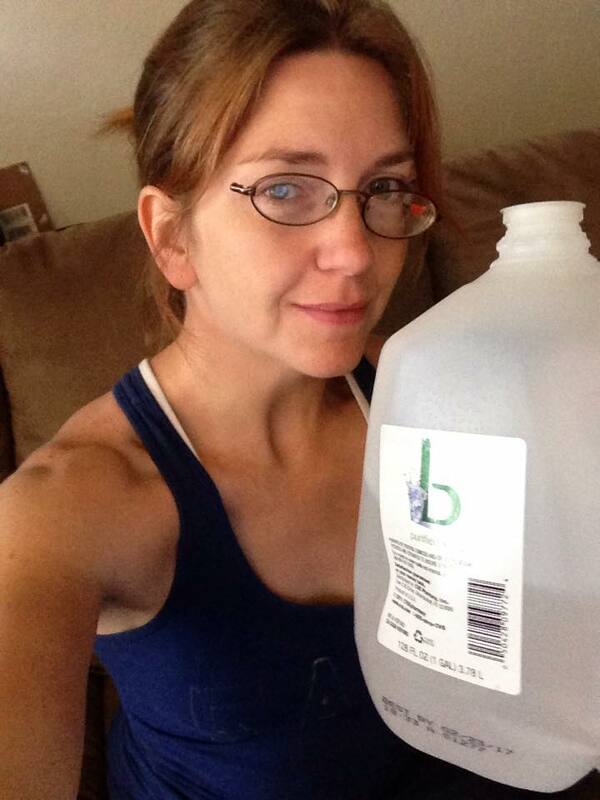 I’m 32 years old, 5’4”, and 145#, looking to GAIN CONSERVATIVELY and working out “everyday”. I also did the formula where I eat 1g of protein per 1# of body weight, .4g of fat per 1# of body weight, and I had it calculate for 7 meals a day. 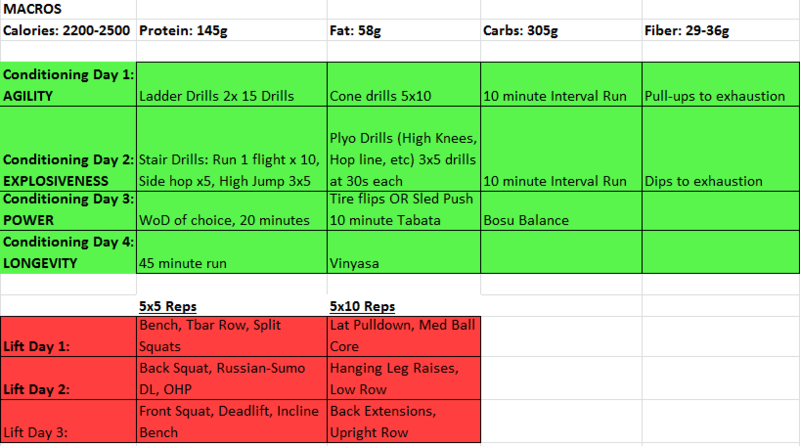 I want everyone to know that while I am super excited about the above schedule of cross-training … I also get a little vomity looking at it. I am not a cardio kind of girl. 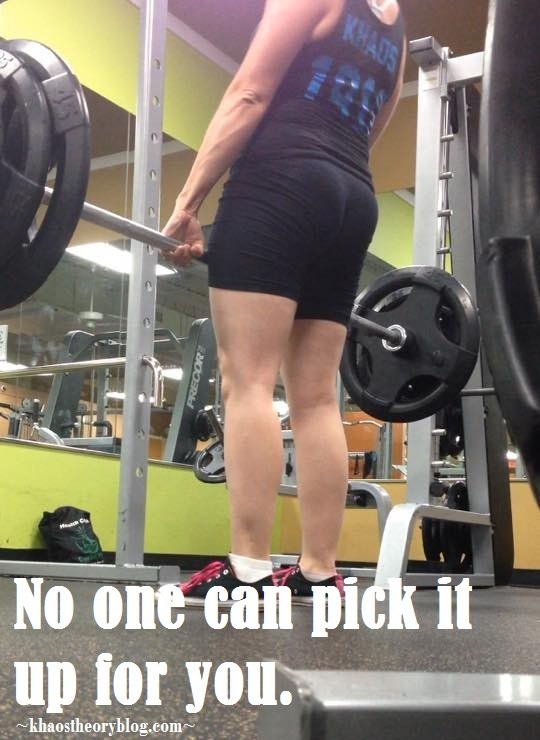 If you know me, or have been keeping up with this blog, than you know that I would rather deadlift every day than run. EVAR. However, too high of a focus on weight training for too long can weigh someone like me down (especially since I cameo jam now and again). So I’m moving my focus to some explosiveness. On my lift days, I’m using a modified 5×5 program, that I have preached about in the past! More about lifting and 5×5 here. 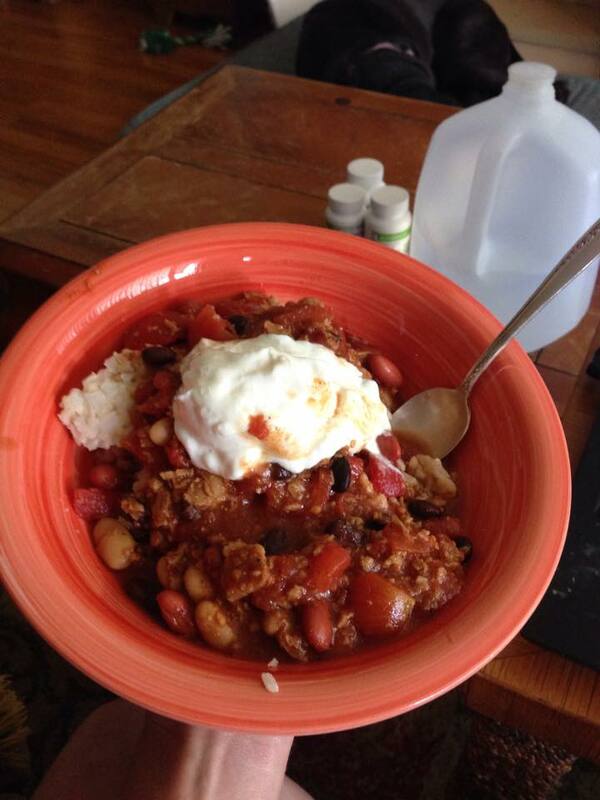 How to build your meals? Look at your macros, use your tracking devices to understand the compositions of your food. Whenever I eat, I make sure there is at least 10g of protein in what I’m eating. Otherwise I pick something else, or add protein to the thing I’m already eating. I also drink a gallon of water a day. I also take vitamins 3x a day. Doing those things helps to keep the metabolism running and helps your body absorb all the things you’re giving it! It’s a lot. It’s confusing. It’s overwhelming. Break it down piece by piece. Map it out. Then, all you have to do it is follow it and be awesome! The nice side effect of mapping out your nutrition and fitness this way? You’ve just made a road map for your daily schedule. Watch your productivity go through the roof!! And don’t be afraid to schedule in “FUN TIME” or “TRAVEL TIME” or “READING”. Do it up! It’s your plan.